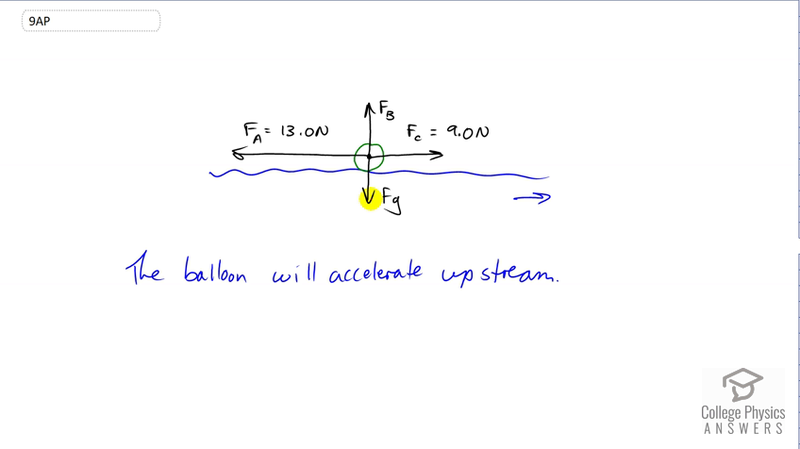 The current in a river exerts a force of 9.0 N on a balloon floating in the river. A wind exerts a force of 13.0 N on the balloon in the opposite direction. Draw a free-body diagram to show the forces acting on the balloon. Use your free-body diagram to predict the effect on the balloon. The balloon will accelerate upstream. This is College Physics Answers with Shaun Dychko. This balloon is floating on the water so that means there is a buoyant force upwards of equal magnitude to the gravity downwards. There is a current moving to the right and it's applying a force due to the current of nine Newtons and we're told that the wind or the air is blowing in the opposite direction to the current with a force of 13 Newtons. Now, since the air is exerting a force greater than the current, there's going to be a net force in the direction of the air which is upstream and so this balloon will accelerate upstream.